One thing that I have always loved about London is its multiculturism. You will find over 150 different nationalities living together in the capital, and one of the largest communities out there is the Chinese one. I have walked many times through Chinatown and I know Soho quite a bit. However, I never thought about learning more and taking a cultural tour of Chinatown until Minji emailed me and invited me to try out the experience she curated. So the next time I was in London, I met with Minji and two American ladies who joined the tour, and went on a discovery tour though Chinatown. Minji has created an immersion cultural tour that takes you from the modern days of 2018 into the rural start of the 20th century, when the first Chinese people arrived to London, as sailors and dock workers. Whilst America was by then very popular with Chinese workers, England, being further away and more expensive to get to, was just opening its doors to migrants. However, the conditions of working in England were much harder and had many more restrictions than in the States. Minji’s tour is designed so you get to be in those people’s shoes, where you have to take decisions and weight the advantages and disadvantages of your choices. 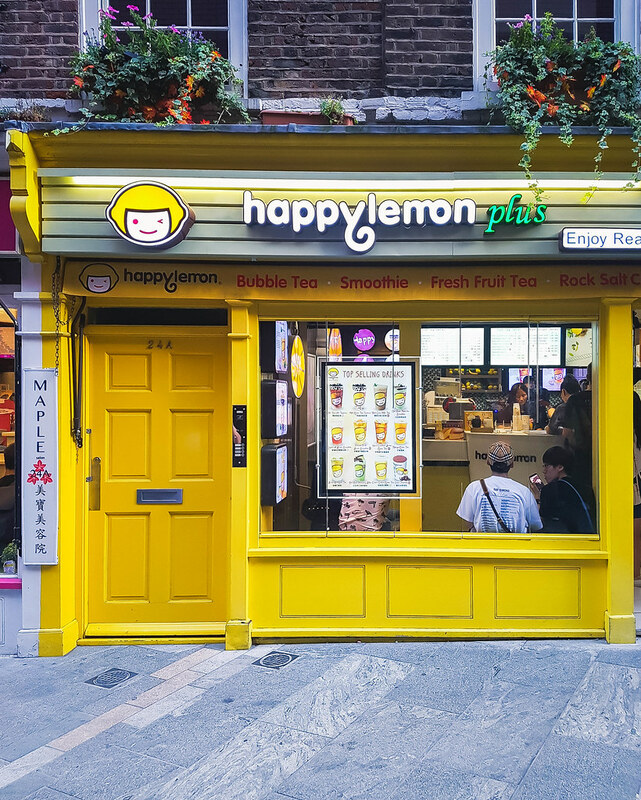 You will learn a lot about how the Chinese community has developed in London and how they brought with them the culture, opening stores, restaurants and supermarkets. 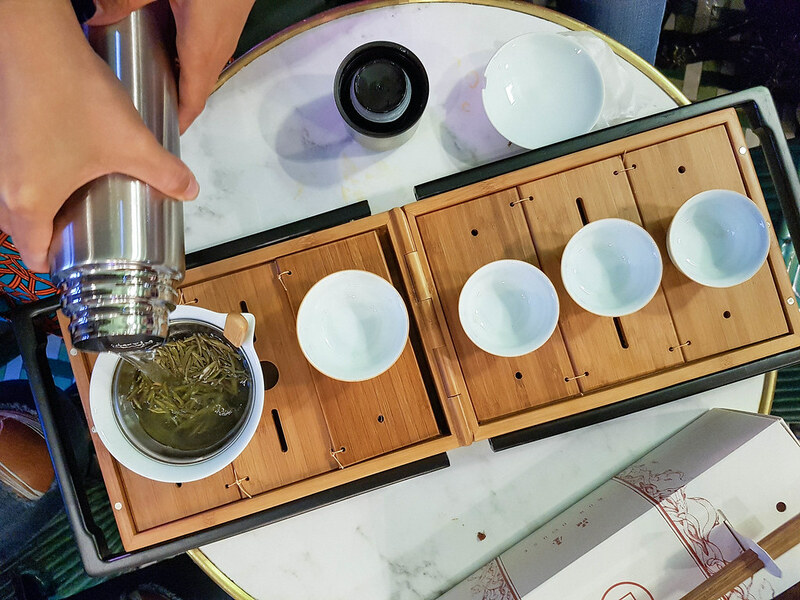 Minji has included in the tour hands-on experiences, such as calligraphy lessons, food tasting and role play. She is a great storyteller and a fantastic tour guide who keeps her groups small so that she can dedicate to each member of it. Why is Chinatown in Soho? First thigs first…. have you ever thought why Chinatown is in the heart of London? 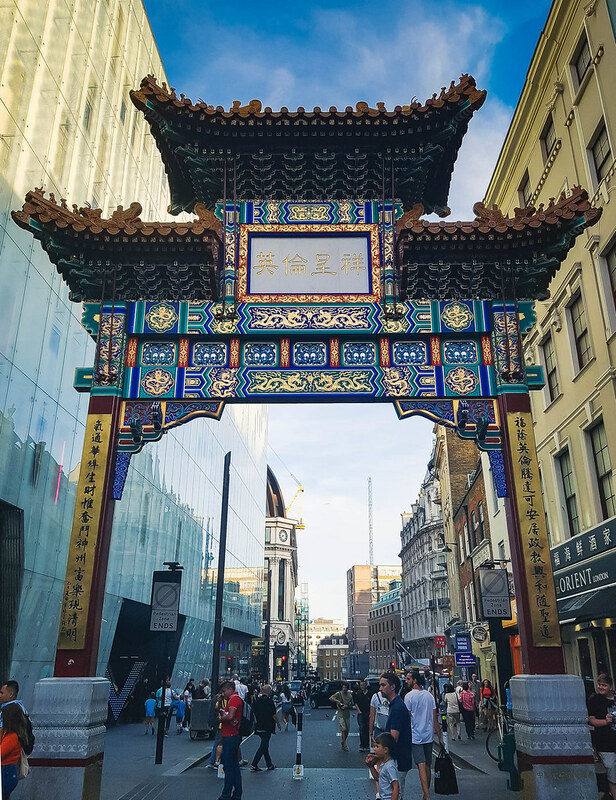 Compared with other capitals, where the Chinese immigrants have settled down at the outskirts and as years passed by the cities incorporated them through development, in London Chinatown was moved to Soho, after the Blitz bombings from the Second World War. The original location of London’s Chinatown was around the docks of Limehouse, which was severely damaged after the war. Why Soho, you may ask? It is because during those times Soho was considered a very bad area to live in due to the high numbers of brothels and questionable things that were happening in the area. Because of it, the rents were very low, so the Chinese took advantage and moved here. Today’s Chinatown was born when the first Chinese restaurant opened, in the 1970s. 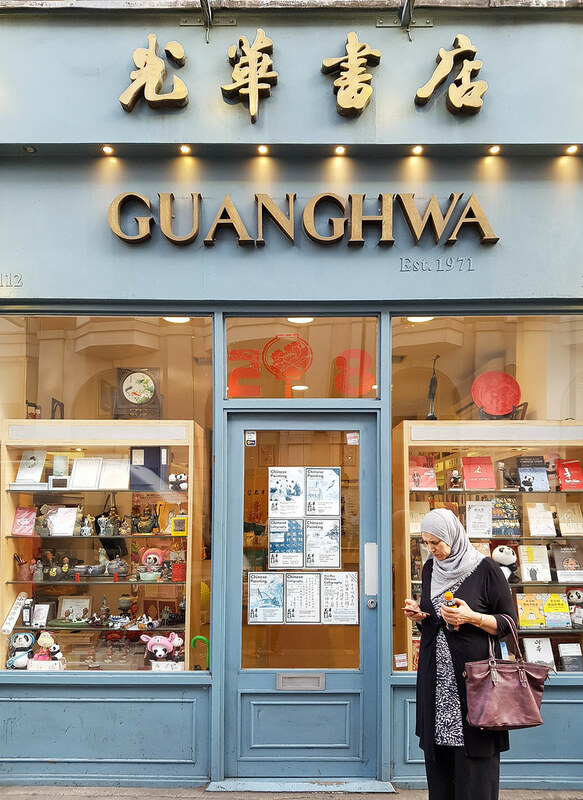 Out first stop was at the Guanghwa Bookshop, on Shaftesbury Avenue, a landmark that made history in the United Kingdom. The bookstore is still today the only of its kind in London and it played a very important part in helping the libraries from the British Universities such as Cambridge or Oxford to have access to Chinese books. In fact, the British Library was one of the bookstore’s most important customer, being able to acquire Chinese books for its collections from it, when the United Kingdom had very little access to China. As we stepped into the small Guanghwa Bookstore, I could notice straight away that it is still an independent shop, run by passionate people. Spread on two floors, the library not only sells books but also supplies for calligraphy, traditional good luck charms, wooden decorations and porcelain cups. 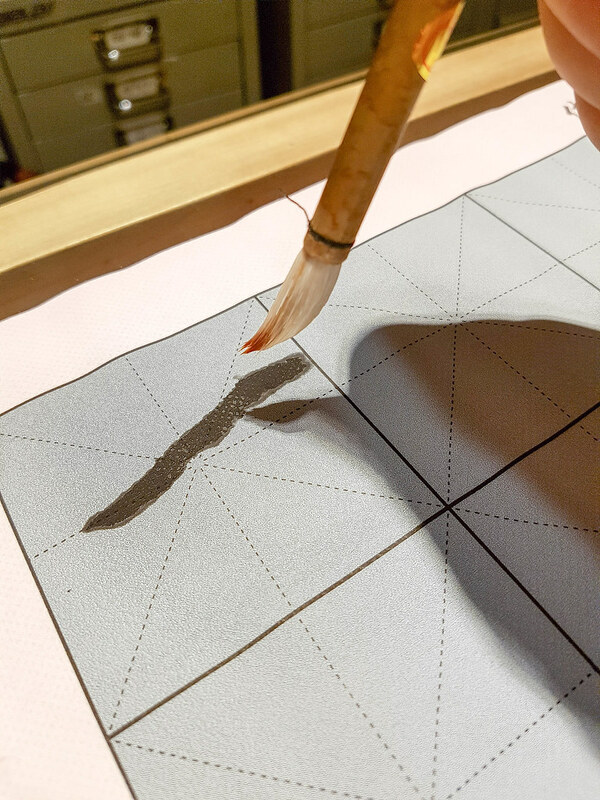 Our first immersion with the culture of China was a quick lesson of traditional calligraphy. The brushes, made out of wolf and sheep’s hair, are stacked one next to the other underneath a glass display. You can see the difference between them, by looking at the color: the sheep ones are white whilst the wolf ones are gray. For our lesson we used reusable paper, and painted with water, which after it dries disappears. Minji thought us how to hold the brush, not like a pen but vertical and firm, keeping the elbow above the table. If today ink is available to buy and it’s cheap as well, when Minji was a student she recalled how she used to make her own ink in school, by dipping the ink stick in water and then grinding it against the ink stone until it gained an oily consistency. Just behind her, on a shelf, I could notice the ink stone and the ink sticks, for sale. Fascinating! Probably one of my most vivid memories from China is not visual, but olfactive! I still remember the smell of the spices as I was passing by restaurants, and the always different aroma of the tea that came with every meal. A few steps further from the Guanghwa Bookshop we opened the door and stepped into the Beijing Tong Ren Tang, a little paradise of spices, herbs and tea that I probably passed by numerous times without noticing it. 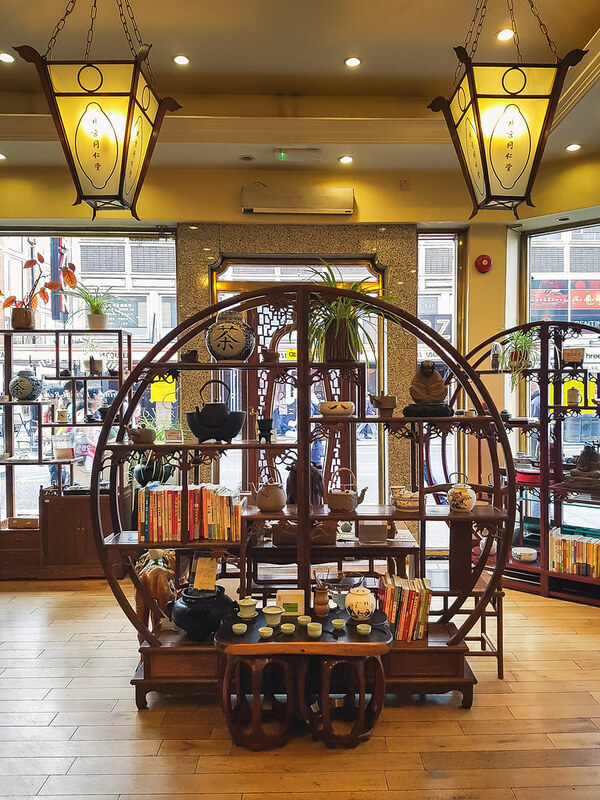 The store is the first European branch of the 1600’s company which supplied the Royal Court of the Qing Dynasty with herbal medicine for 188 years, in Beijing. As soon as I stepped in I was hit by a floral aroma that I was unable to identify. As the different scents of different herbs mix together, if I were to close my eyes I could have easily imagined that I was in a old stone village in China having a cup of tea at the shadow of a magnolia tree. 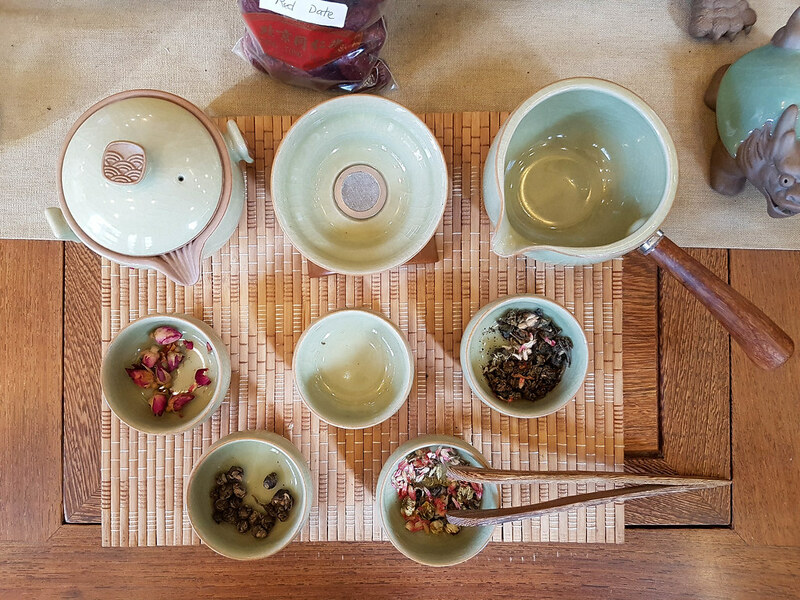 As you might know already, plants and herbs are very important in the Chinese culture. They are used for a diverse range of purposes: in cooking, for drinking, as medicine, or for wellbeing. Inside the store, next to the floor to ceiling wooden cabinets and jars with giant mushrooms and dried flower jars, we were put to the test. Minji took us through a journey of scents, from the classic tummy ache relief peppermint to herbs that I never heard of before. One of the surprises inside the small bottles was the rhubarb, “the great yellow” as the Chinese called and used it as a medicine for thousands of years. As Minji describes her tour, there is something to see, something to touch, something to hear and something to taste. London’s Chinatown is full of bustling restaurants displaying roasted ducks in their windows and large menus of dim sum outside their doors. However, it takes a local to know which the most authentic ones are. As Minji explained, most of the restaurants in Chinatown will have a Southern menu and there will be just a few that will sell Northern Chinese food. You might make the same mistake as I did, thinking that the roasted ducks in the windows are Peking – they are actually Cantonese roasted ducks which are served in chopped chunks over rice. If you’ve had Peking duck before you will know that in this recipe the bird is carved off the bones and served with cucumber, shallots, hoisin sauce and steamed pancakes. There are a few steps to recognise a good Chinese restaurant in Chinatown, and Minji has explained them very well on her Instagram. 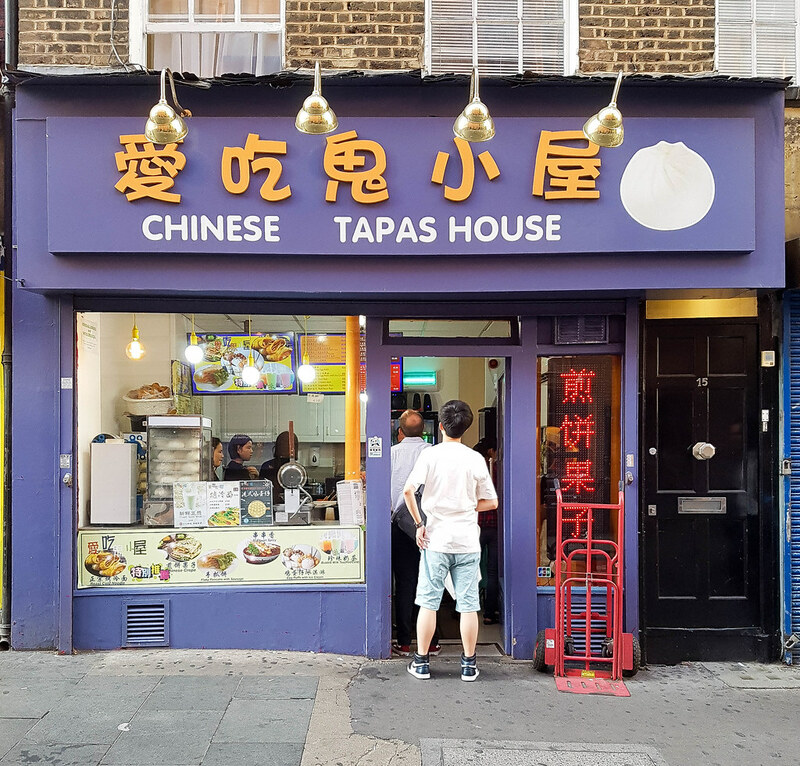 Out first stop was the Chinese Tapas House, a tiny modest looking takeaway restaurant, with two big griddles on which food was cooked on constantly. The place had a constant buzz and people were coming in to order one after another. 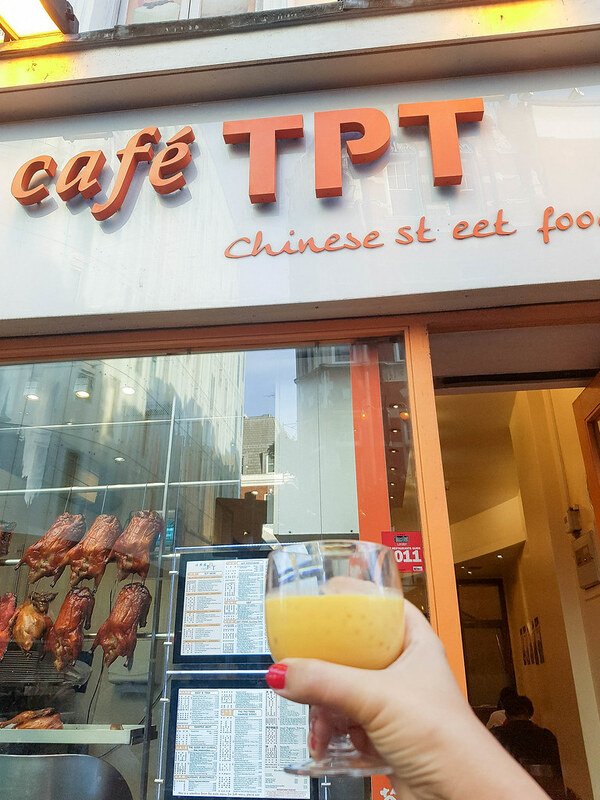 Here is where we tasted the Chinese crepe, a hearty breakfast that can easily replace lunch. 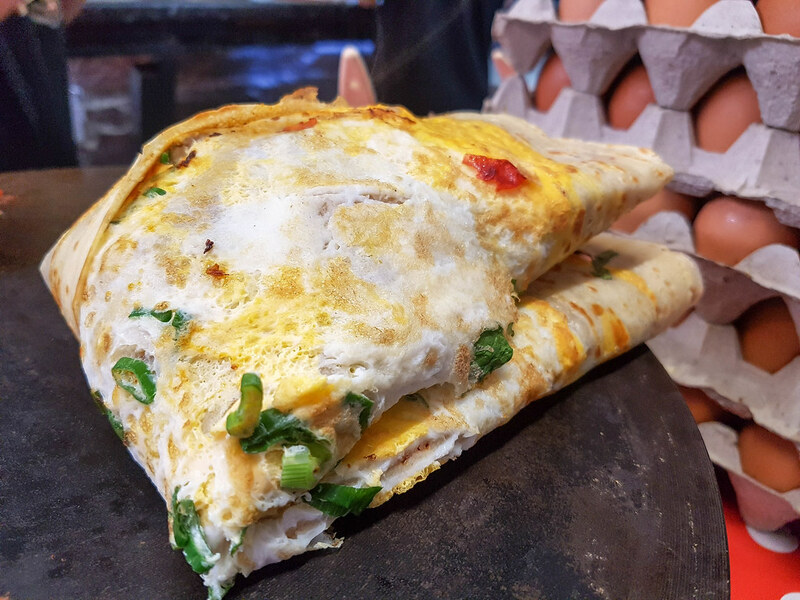 The Chinese crepe is a savoury dish made with a thin batter on top of which eggs are added. As it’s cooking, there are different toppings added such as Chinese pickles, sausages, crispy fried crackers, a sweet sauce and different herbs. It is rolled multiple times so that the toppings stay in and you can eat it easier. 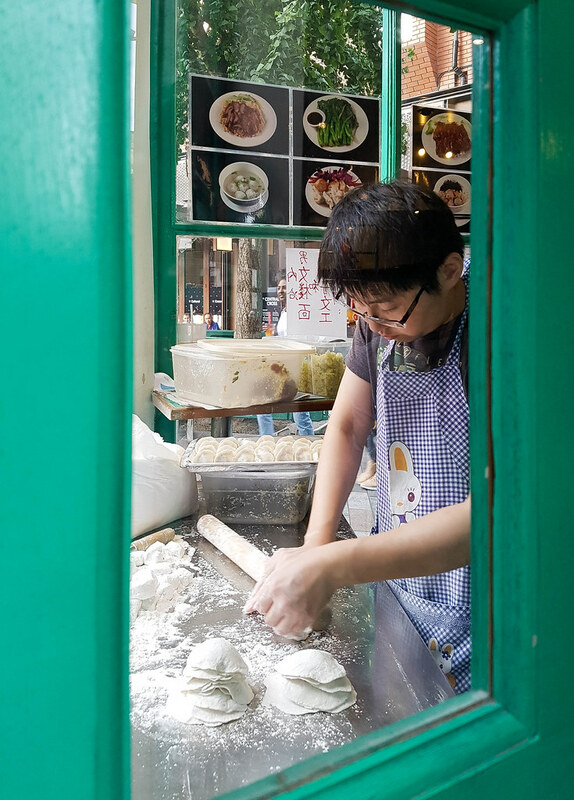 The Jian Bing is probably one of the most common street foods in China. It tastes like an omelette inside a crepe, it is soft, but with a crunchy bite because of the crackers and it also has a hint of sweetness from the sauce. It’s really good! The second treat of the tour was the mango sago, a drink that I was tasting for the first time. I am not really keen on mango to be honest, depending on how powerful the flavour is. I did enjoy the drink however, and I assume it was because the recipe includes coconut milk, which tames the strong taste of mango. Sago is similar with tapioca, but it comes from a different plant. Overall, the drink was very refreshing and tasted nice. We ended our tour at the Bun House, where we had a custard bun, and where Minji surprised us with a homemade tea served in the cutest Chinese set ever. I liked the bun so much that I did buy four more (pretty much the entire menu: the chicken, the lamb, the fish and the pork) and had it as a takeaway for my next day’s lunch. 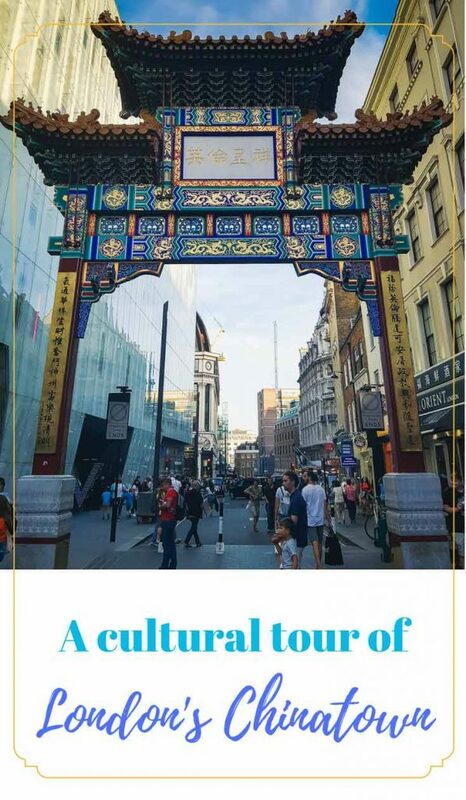 I would recommend the experience trough Chinatown that Minji has created as it is a brilliant way of discovering an unknown cultural part of London. Even if you are a tourist or a local, this interactive tour takes you through a journey of learning, discovering and imagining how Chinatown came to be as what it is today. 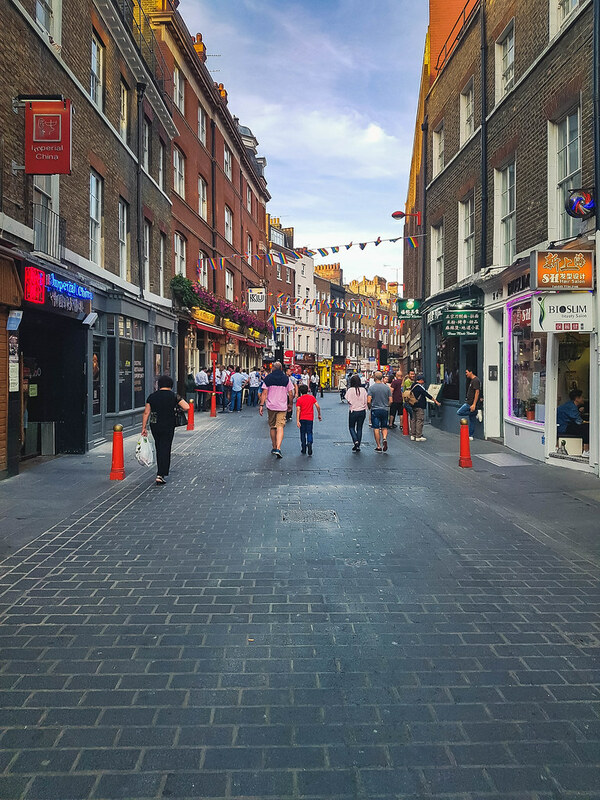 Maybe not as big as in other capitals of the world, London’s Chinatown is a fascinating gateway towards a community that has so many stories to tell, stories that Minji is listening to and including into this marvellous experience. You can book her tour through AirBnB Experiences here. Disclaimer: I have been invited to join this tour. However, all the opinions featured in this post are completely mine and have not been influenced. Celebrating our cultural diversity is a good way of promoting peace. The historical information supplied is quite educative. Your pictures are fantastic. It made me feel like I was right there with you. I loved just looking at the herbs. Fascinating! It’s very interesting that you were able to take a tour. I think that would be something that I would enjoy. I’d also love to taste some of their Chinese food. I wonder how different it is from the Americanized version. I love these pictures! You did a great job taking me through your adventure. I am not really a traveler, but I love reading about other places. One can learn a lot when exploring a certain culture, every time I visit China town here in my place I enjoy it. Most especially meeting the people and enjoying the food! This Chinatown is incredible! The place looks clean and everything is in order. I love how many stores are in there too. I wish our Chinatown can be this orderly too. It is fascinating how Chinese people get to put their own mark on any foreign land.Their culture is influencing a lot of nations. And tjey thrive just almost anywhere. I have to admit I’ve never been to Chinatown in London but what an awesome looking place to get to go and explore! I would love to take a trip myself, perhaps I’ll have to look into planning one! I’ve been to China Town so many times myself and looked around but never knew you could join tours there. That sounds like a good idea to help discover something new. Chinatown, London is a nice place to visit. My friends used to live there and told me that London is a great place! I’ve always wondered the same thing about Chinatown being in SoHo. I like to visit whenever I get a chance. Wonderful photos! Chinatown in London and NYC are at the top of my list of places to visit. I would looove to try the food. Thanks for sharing! This is a really interesting read and I’ve certainly learnt something today. Celebrating cultural diversity is so important, especially right now with Brexit hitting us and hate crimes at such a high. Although I have been to China Town several times, I had no idea about the tour. Sounds like a great opportunity to explore it and try some lovely treats. So many beautiful pictures are here. I have never heard of ink stone. I bet it is fascinating to see in person. I have yet to try an Air Bnb experience but there are a few i have my eye on. This cultural tour seems to include a lot of authentic items from the spices, the bookstore and of course the food. There looks like there is so much to explore here! I would love to be able to take in all the sights. I love china town it is such a vibrant place to visit, the colours and the smells are amazing. I would absolutely love to do this tour and learn more about an area of london I adore.